How do I insert stimulus content in Quizzes.Next? 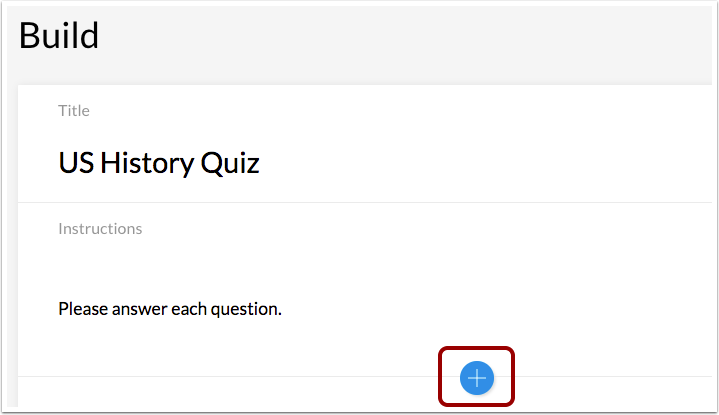 When creating an assessment, you can insert stimulus content in Quizzes.Next. Stimulus content gives students a piece of content with associated questions. Click the Add Stimulus button. To create a stimulus title, add a title to the Title field . To add instructions for the stimulus, add instructions to the Instructions field . 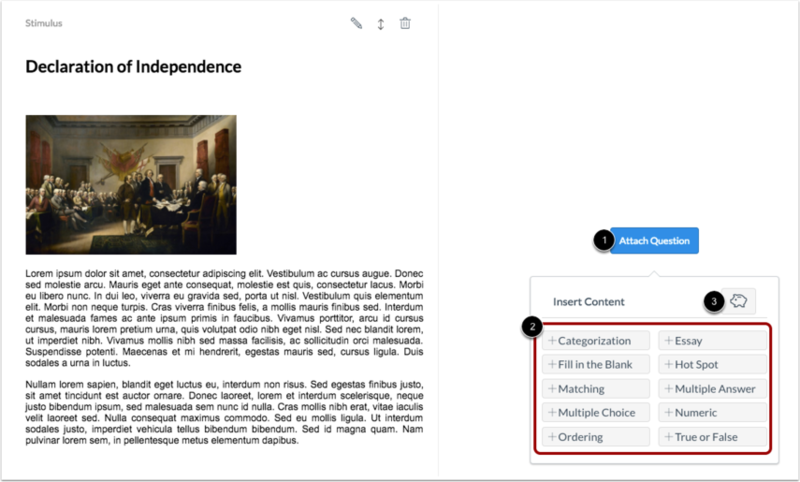 To add content for the stimulus, type or paste content into the Rich Content Editor . 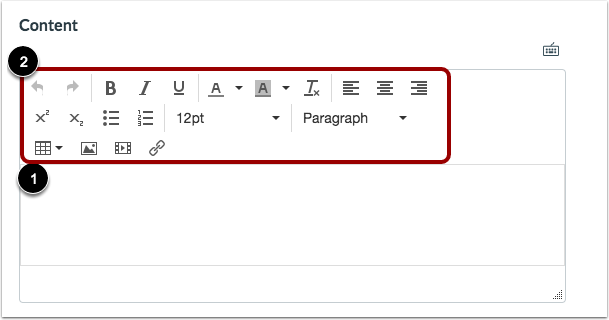 To format text or add media, links, or tables, use the Rich Content Editor icons . To add a source URL, enter the URL in the Source URL field. To add the stimulus to an item bank, click the Add to Bank link. 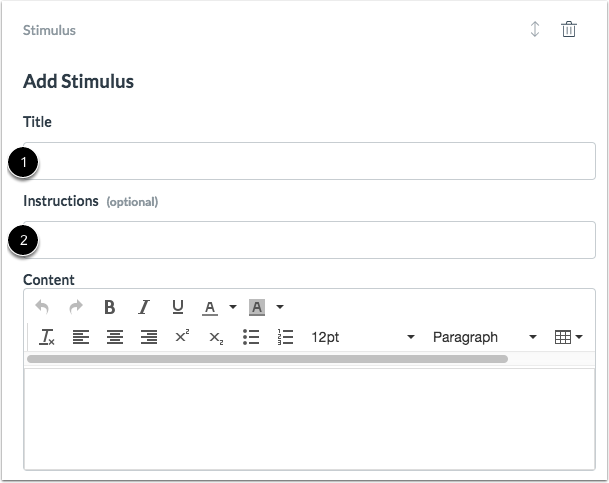 To attach a question to the stimulus, click the Attach Question button . Then click the question type you want to attach . You can also select content from an item bank . All question types can be associated with stimulus content. Note: If a question is not attached to the stimulus, the stimulus will not appear in students' assessments. The stimulus and question will appear side by side in the assessment. 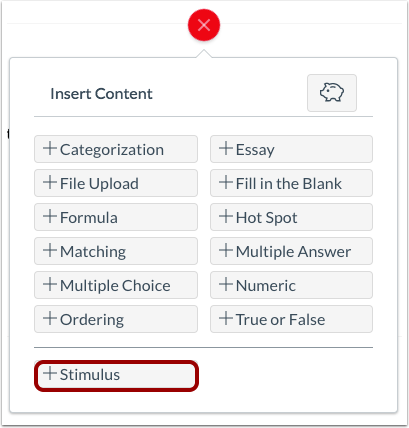 To attach another question to the stimulus, click the Attach Question button. Note: Multiple questions attached to a stimulus will each appear next to the stimulus when the assessment is set to display one question at a time. Previous Topic:How do I create a True or False question in Quizzes.Next? Next Topic:How do I add feedback to an assessment question in Quizzes.Next? Table of Contents > Quizzes.Next > How do I insert stimulus content in Quizzes.Next? It would be helpful if students could expand the stimulus to better see the content and then make it small again to see the questions. Thanks for adding your thoughts to the Canvas guides. We're always looking for ways to improve Canvas. If this is something you feel should be added to Canvas, you're welcome to submit a feature idea suggesting this functionality. Feature ideas are posted on the Canvas Studio where other users can vote and comment on the idea. For more information about adding a feature idea see: How do I create a new feature idea in the Canvas Community? For more information about the feature idea process see: How does the feature idea process work in the Canvas Community? If you have any other questions, please let us know! 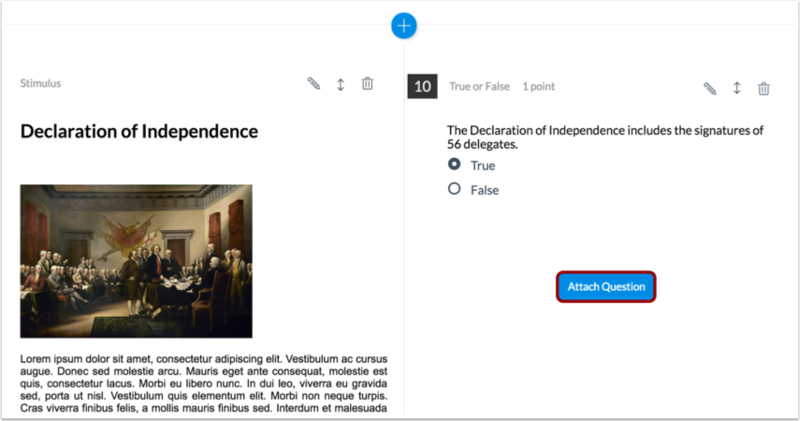 Re: How can I add a file to a quiz question in a question bank? Re: Multiple questions under 1 header?